Mothers are the lynchpin of Irish society. They hold everything together and keep their children from falling apart. Sure, we love to slag them and they can annoy us like no one else, but beneath all that – what would we do without them? If your mother has Celtic roots or just loves the Emerald Isle, she might appreciate some Irish gifts on Mother’s Day. What will send her just the right message to tell her how much appreciate her? Let’s look at some of our favorite Irish gifts for mothers. Mother’s Family Jewelry – If you have siblings and you all want to go in together to really treat your mother this year, you could get her a piece of mother’s family jewelry. These sparkling symbols of devotion feature each child’s birthstone set in a necklace or ring. 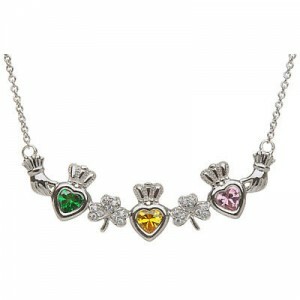 Would your mother love one with an Irish motif? Trinket Box –Your mother probably has some little trinkets that are dear to her heart. Jewelry, a seashell picked up on a family vacation or some other little memento. If she doesn’t have a trinket box for it, this is a thoughtful and practical way to give her a stunning piece of Belleek. Monogramed Tote Bag – When you were a child, mom’s purse seemed magical. Whatever you needed was stashed in there somewhere – a tissue, a cough drop, lip balm, a snack or a bandage was always at the ready. A monogrammed tote bag with an Irish motif is a great way to tell mom that you saw that. You appreciate her hauling all that stuff around just in case you needed it. Vase – Odds are that you or your siblings broke a vase or two growing up. Isn’t it only right to give mom a replacement? Which would she prefer, delicate Belleek with shamrocks or some sparkling crystal to capture the light? Vases are great Irish gifts for anyone who loves gardening or just loves flowers. Shawl or Wrap – Changeable spring weather makes a light, stylish shawl or wrap a very handy item to own. Does your mother have one? If she loves to look good and stay cozy, she’d delight to unwrap a wrap on Mother’s Day. All of these Irish gifts are only symbols, tokens to send a message to your mother. It isn’t always easy to find the right words to express yourself with your mother. Most of us spend as much time fighting with our mothers as we do asking for their help. Mothers’ Day is the one time to turn the tables and see what we can do for mom. So along with her card and gift, please hang up your jacket and set the table without being asked.